As much as I enjoy the New York Yankees, this blog is for educational purposes for my Business Administration class at the University of Delaware. This class is BUAD 477, Information Technology Applications in Marketing. We were instructed to pick a theme that we are passionate about, and create an account on blogger to post our weekly thoughts. Each member of my class has a different theme and corresponding blog. To see their blogs and to view my class blog, please click here. I chose my theme to be the New York Yankees, as they are one of my favorite spots teams! The New York Yankees won an important series this past weekend, beating their ultimate rival Boston Red Sox two games to three. As a short recap of the series, on Friday 9/9, Aaron Small defeated David Wells (who used to pitch for New York) in the pitching duel and Alex Rodriguez forty first home run helped the Yanks to an 8-4 victory. However, on Saturday 9/10, Sean Chacon gave up several home runs to allow Boston an early 8-0 lead, which the Yankees never recovered from. Curt Schilling also had his best pitching outing in recent times, which aided the Sox. Sunday's game, on the fourth anniversary of 9/11, was the rubber match game in the Bronx. How could the Yankees not have felt the emotion and strength to win this won for the people of New York City on this day? Randy Johnson proved why he is one of the best pitchers in baseball today with eight strike outs and only two walks. It was all the support Jason Giambi, who has been playing 110% better in late August and thus far , to hit a home run and give the Yankees a 1-0 win. However, Mariano Rivera, New York's future Hall of Famer closer, still looked shaky to me. He put Manny Ramirez on base with a walk and Kevin Millar on first with a single, and a hit by pinch-hitter John Olerud could have meant another loss for the Yanks. Thankfully, Rivera came into his old form and struck him out, leaving the two base runners stranded, and preserved the Yanks' win. Every win for the remainder of the season (twenty games as of September 12th) is an important, and almost crucial one for New York. They are in the playoff hunt (yes, they are NOT out of it yet) with the Cleveland Indians and the Oakland Athletics, presently being one game and a half behind the Indians for the American League wild card spot. Now, they only remain three games behind Boston for the Eastern Division of the American League title. In other notable New York news, several Yankee players have been nominated for honors recently. Jorge Posada, catcher, has been nominated for the Roberto Clemente award, given to the player who"best exemplifies the game of baseball, sportsmanship, community involvement and the individual's contribution to his team", according to www.yankees.com This is an excellent example of how some players' use their fame and fortune for the good of the community. Derek Jeter is a finalist for the Marvin Miller Man of the Year award, given to the player in each division whose on-field performance and community contributions inspire others. Jason Giambi, the first baseman, is nominated for the Comeback Player of the year, after starting the season off at less than average, and slowly has been regaining his bat power and confidence to give the Yanks a major lift when they need it. I will keep you guys posted as to whether or not any of these men win their respective awards! Great job on your blog. I love the YANKEEES and you go into great detail in your blog. I also like how you give the scores and details of the games that just happened. I think you should write some more about Alex Rodriguez- my favorite player. He is very talented and brings a lot to the team. I am excited to see what will happen with the rest of the season and hopeful that they will make it to the playoffs. I also liked the pictures on your page- keep up the good work. Nickie...Great job on the blog. It looks great and is very informative. I look forward to following the Yankees on your blog for the rest of the season. 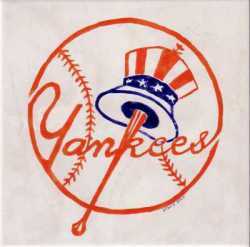 I am a big baseball fan and will be interested to see what others have to say about the Yankees. In the game where Aaron Small outpitched David Wells I was very happy to see the Yankees win. I am not a big Red Sox fan and I am not a big David Wells fan ever since he left the Yankees. Small has proven to be a very good pitcher under pressure and has come out on top through most of his outings. Congratulations and good luck to Jorge, Jeter and Giambi for their nominations of their respective awards.